With roots all over North America, the Malvinas pull together a broad palette of regional flavours including: the blues-tinged grooves of the deep South, the spicy Cajun flavours of Louisiana, the Celtic modes of Eastern Canada and the groovy troubadour tradition of the Catskill region. Alternating lead vocalists, tight harmonies and quirky instrumentation (banjo, guitar, tenor guitar, mandolins and violin) create a high energy sound that never forgets that to make great music, you start with a great song. Individually and collectively, The Malvinas have been fortunate to work as side women and to share the stage with some really great artists including: Bruce Daigrepont, Jack Hardy, Eliza Gilkyson, Ray Wylie Hubbard and Tim Grimm. Past appearances include: The New Orleans Jazz and Heritage Festival, Festival Internationale, The Kerrville Folk Festival and WFMT ‘s Folkstage. Lisa “I am not interested in what you think” Markley (banjo, guitar and vocals). After graduating from North Texas with a degree in music, Lisa melted down her trombone to make a belly button ring. Formerly a member of the way cool band Akoustik Nerve, Lisa is inspired by the music of Joni Mitchell and the Subdudes – and- she thinks that Patricia Barber is just the coolest thing since fresh cilantro. Lisa is also an award winning songwriter with a inimitable groove oriented edge. Gina “the hopeful romantic” Forsyth (guitar, violin, vocals). Since fleeing the Bible Belt an undisclosed number of years ago, Gina has been (in no particular order): a fiddle player in several Cajun bands, a folk DJ on a college station, a college student, a civil servant, a movie extra for a day, and a drummer in a punk rock band for all of five minutes. Her favorite artists include the McGarrigle Sisters, Ralph Stanley, Belton Richard, and a host of friends she has played and recorded with over the last several years. Beth “the irritating optimist” Cahill (mandolins, tenor guitar and vocals). Beth decided to pursue music after nearly being crushed to death at a Violent Femmes concert. She never gets tired of listening to Glenn Gould’s recordings of the Goldberg Variations and trying to explain 100 Years of Solitude by Gabriel Garcia Marquez. Her influences include: Rickie Lee Jones, The Roches, and Richard Thompson. She is from Canada and has no sense of humour. The Malvinas on the road. 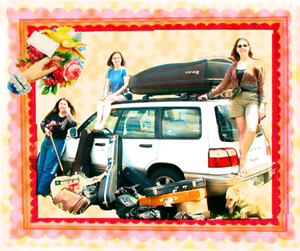 Yes, we really can get all those instruments into a Subaru!